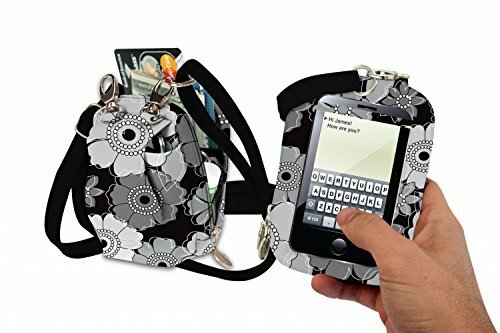 When a small bag is all you need… cell phone purse plus by Charm14 fit your small cell phone into the back of this purse and you can operate your phone right through the clear window. 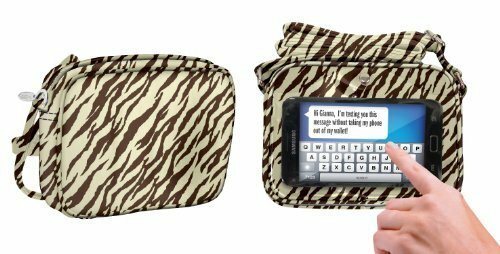 Texting, e-mails, music, snapchat, twitter and more are all now at your fingertips without removing your phone from this wristlet wallet. The days of looking through your purse for your cell phone are over when you switch to this small wallet purse. This cross body small purse replaces your big, bulky handbag in an instant. You'll be amazed at all that this cute handbag can hold. The back clear window fits the new iPhone se or iphone5 or brands similar size phones. The front pocket with flap fits the iphone7, iphone6 & 6e and other brands similar size phones. 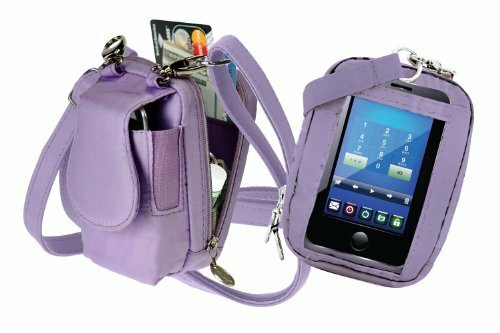 Even small cameras fit in front pocket large zippered compartment for your cash, cards, needed accessories and more. Elastic lipstick holder inside small removable wristlet strap long adjustable strap- from 24”-60” long size: 5.5"h x 3.5"w x 2" d material: Cotton/poly. Sleek, stylish and on the go perfect little stylish handbag for any occasion featuring the touchscreen pouch for all smart phones. This purse allows you to use the smartphone while still being protected in the clear pouch. 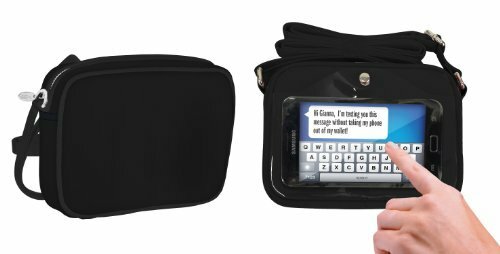 Do all your texting and more through the clear pouch. Dimensions 7w" x 5.5h" x 1.5d" material: Cotton/poly. Charm14 is proud to bring you the new and improved PursePlus Touch. All Phones will fit in the front secure pocket, even with cases such as the OtterBox!The redesigned back window is now used for most touch-screen phones. Slide your iPhone or other touchscreen phone into the back, and you can operate your phone right through the clear window. Texting, e-mails, Facebook, Twitter, Pandora and more are all now at your fingertips without removing your phone. The days of looking through your purse for your cell phone are over when you switch to the PursePlus Touch. This cross-body small purse replaces your big, bulky handbag in an instant. You'll be amazed at all that this cute handbag can hold. Have a smartphone, iPhone, or blackberry? No problem! The front flap opens up and fits ALL phones, regardless of the size. No smartphone is too big for the PursePlus Touch. Unzipper the back compartment and you'll have room to stash away all of your credit cards, money, gift cards, club cards, etc. There's an elastic lip-gloss or lipstick holder on the inside too. The bag is worn either cross-body or around your waist with the adjustable long strap. The long strap adjusts up to 60". There is a short strap that can be used as a wristlet or to clip around another purse if you choose. 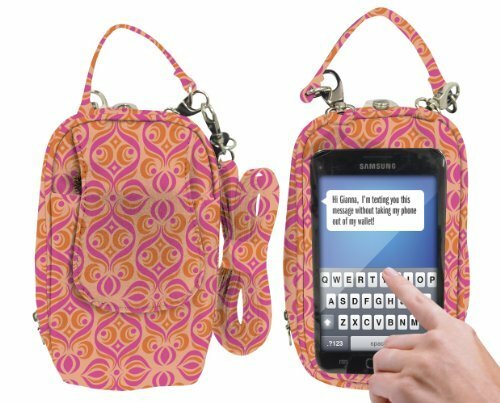 Very functional purse bag that enables you to use your touchscreen phone without removing it from your bag. The clear protective pocket allows you to use touchscreen capabilities on your phone while it is still in the bag. It also has plenty of room inside for cash, credit cards, cosmetics and much more. It features an adjustable and removeable strap for ease and comfort. It is made of 100% polyester and is easy to clean. The bag closes wtih a zipper. 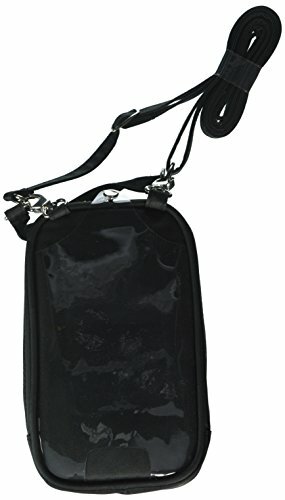 It makes a very nice and convenient small purse for traveling or just running errands. 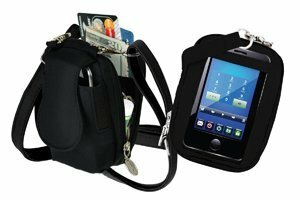 Very functional cross body bag that enables you to use your touchscreen phone without removing it from your bag. The clear protective pocket allows you to use touchscreen capabilities on your phone while it is still in the bag. It also has plenty of room inside for cash, credit cards, cosmetics and much more. It features an adjustable and removeable strap for ease and comfort. It is made of 100% polyester and is easy to clean. The bag closes wtih a zipper. It makes a very nice and convenient small purse for traveling or just running errands. Compare prices on Charm 14 at ShoppinGent.com – use promo codes and coupons for best offers and deals. Start smart buying with ShoppinGent.com right now and choose your golden price on every purchase.